A friend commented on some of the negativity in my blog lately (he meant all those American Airlines posts), so I've decided to write a positive one to end this week :). I've been using Windows 7 since early beta, and the RTM version since September. I recently read somewhere that the single best, cost-effective upgrade you can add to your laptop would be a Solid State Drive. I always had great belief in Flash technologies. I owned one of the first flash drives, called Disk-On-Key from M-Systems. I paid quite a hefty sum in 2002 for a 128MB piece of Flash memory, at a time people were slowly switching from mountains of floppies to slightly smaller mounts of CDs (DVD-RAM was just on the horizon). At the time, people didn't really understand the significance of the technology. I just enjoyed being able to lug around the equivalent of 80 floppies in my pocket. Today, everyone has at least one such "flash drive" at arm's reach, and the capacity is measured in gigs. So here I am, 8 years later, buying a 128GB flash drive (Gordon Moore, consider your law officially broken :) ). I delayed my decision for quite some time, debating between the Intel X-25M series, Crucial and Corsair. Finally, mostly due to the high Intel prices, I went with the Corsair P128. It has 128GB, a 128MB buffer, 220Mb/s read speed, 200Mb/s write speed, and a Samsung controller. Buying it from amazon set me back $369 - but so far, I'm happy as can be. Notice that although the overall score is the same, this is due to my graphics card - look at the HD score). The overall experience is that of having a new, faster laptop. I can't comment on the battery life improvement yet, as I had no chance to test it, and as for the noise levels, my Thinkpad was already one of the most silent laptops I ever owned, and it's even quieter now. Bottom line: I recommend adding an SSD to your computer if you want a noticeable bump in speed. Prices are still quite high now (over $2.50/gig, compared to $0.15/gig for regular SATA drives). You can wait for the imminent price drop. Or you can buy one now and consider the time you save and the overall speed improvement well worth the price paid. 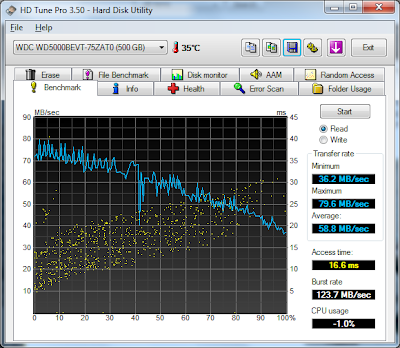 PS: to improve the life span of your SSD and the overall performance of your Windows 7, I recommend going through some of the tips and tweaks outlined in this post. The main drive is to transfer all those temp files off your SSD and keep it focused on applications and files.